It's all just fun, fun, fun with those guys! I thought I wouldn't get anything for this topic for Illustration Friday, but this came into my head last night, so I scribbled it out quickly in pencil, scanned it and added some colour in Photoshop. This is pretty much an unfinished sketch - I had planned to work it up further, but Jill said that it could lose something with doing that, and I think she was right. Yeah I like the looseness of this illo ian. There's pros and cons with both methods and i find myself alternating between the two. I agree with Jill and anthony. This is a fun image! This works really well with the loose feel, it appears very relaxed, like the pose itself. I like the Moon-like image under the table. He seems more phased being closer to the angel. Hello Ian, I spent quite a while looking at your sketch, had to take it all in! Its wonderfully composed and has a real punch. clever idea! i like the soft lines. 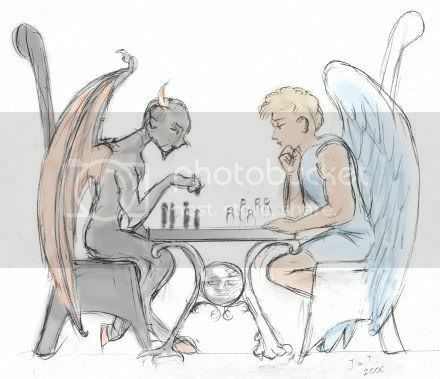 Yes, devil and angel both look relaxed and consumed by the game. I like the looseness of this piece, gives it a edgy, energetic feel. Sharp piece of work! Beautiful!!! Love that Angel. Wow!! Interesting piece, I like the flow. Very intense and the Angel looks composed and assured, the face under the table adds to the interest. I like the quick look of this...it makes it seem like it's taking place in a less tangible realm (and in fact, it is). I like the disc with the face in the middle of the table - perhaps it's someone's soul that they are playing chess over? Well done! you did a bautiful job on this and it's a clever idea!!! I see a third face in the circular part of the table, am i crazy?